It’s been a very long time coming, but I’ve finally sat down, focused, and designed the contextual model around the content and coaching I provide for the “business of being a family in business.” It’s my first draft and I’m honestly surprised it came out so well. I’m just learning about contextual models – and learning from the very best, Neen James. Long story short… I’ve greatly admired Neen for a few years. I’ve seen her present last year at Heroic Public Speaking and although I couldn’t attend this year, I “played along” online and gave myself the time and space to once again focus on her ideas. Thanks Neen for the inspiration, education, and spark I needed to GET THIS DONE! This is a rough “first draft,” and I’m no artist. The energy and power of the ideas come through, so I’m happy to share it with you. What is a Contextual Model? In a nutshell, a contextual model is a visual representation of the ideas, methods, and processes you have uniquely created within your business or service. This is my own decades-old set of ideas that I work through with clients to help them on their family business journey. The model is divided into four quadrants. These are the four possible states your family business could be in at any given moment. Next, you will notice the concepts between each quadrant. Finally, left in the middle hanging out all on their own are the two most important concepts, Predicament and People. They live in the middle because they are important and relevant during every stage of your business. Predicament and People are at the heart of every business. ALWAYS pay attention to how they affect you. 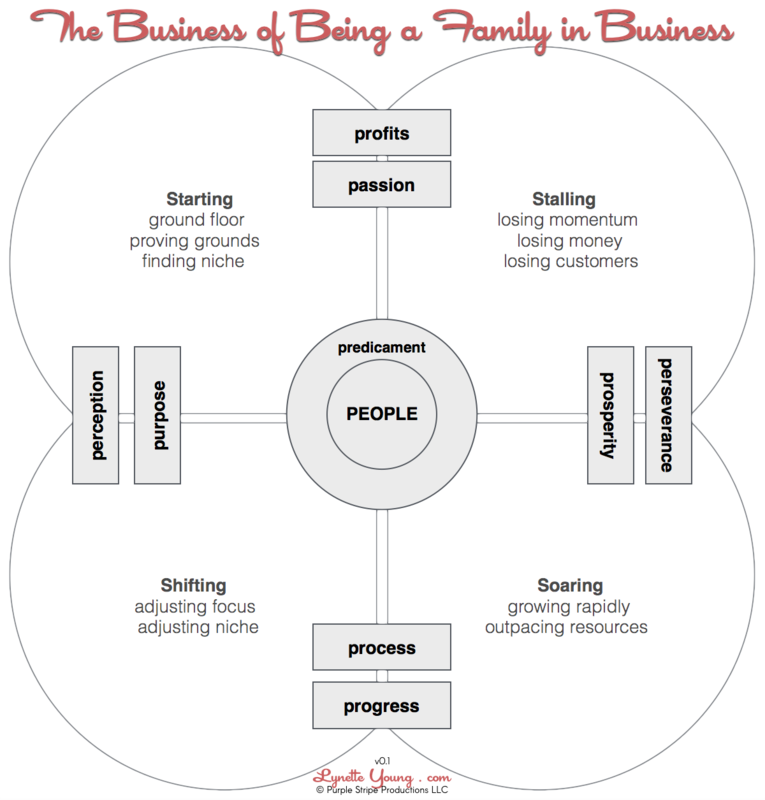 If you own a family business and want to see how you can use this model to attract positive change into your business and include your family in that process, I would love to be of service to you as a coach.